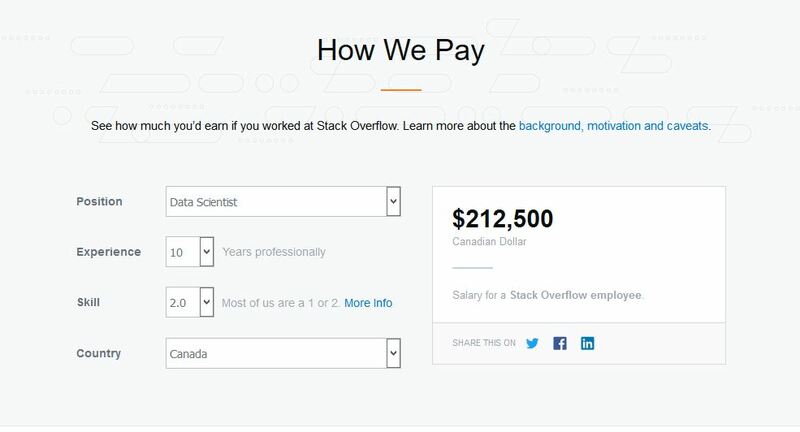 A little over a year ago, we launched How We Pay, an interactive tool that shows how much you'd earn if you worked at Stack Overflow. We believe that developers should have as much information as possible when looking for a job - this includes salaries. Being transparent with developer, product manager, and designer salaries at Stack Overflow was a way for us to be public with that data. 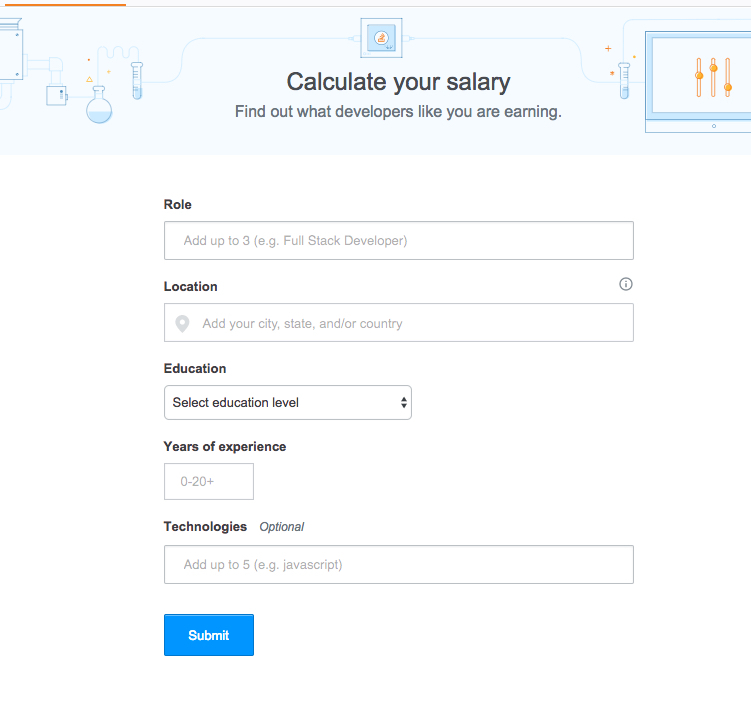 Today, we're launching a new Salary Calculator for developers to discover their earning potential and build their careers. This new calculator allows you to see where you compare with others in your role and location, and will give you greater insight when either looking for a new job or evaluating your current one. Using the data from the 2017 annual survey, we'll calculate a salary range based on parameters submitted. You will be able to search salaries for any given role, location, education, experience, and even specific technologies. Based on the amount of data we received in the survey results, the initial release has limited salaries to the United States, Canada, the United Kingdom, France, and Germany. There are more details available on the blog, in the Geography section. While the data used to create the calculator is from the 2017 annual survey, we've created a way for you to help improve it by providing your current salary. You can be sure that anything you share with us about your salary is completely confidential - it will never be shown on your profile or shared with employers - providing it is totally voluntary and not required to use the tool. If you want to know about the methodology and the model used in the calculator, head over to the blog where Julia Silge goes into detail about how this was done. In the meantime, if you run into any bugs with the new calculator, please post here on Meta Stack Overflow and tag it with bug and salary-calculator. As always feedback is welcome, so try out the calculator and let us know what you think! We've received a lot of feedback about the UK/EUR salaries appearing to be incorrect, based on that feedback Julia reviewed the model and found there was a bug with how we were doing the currency conversion. This has been fixed and a new version of the calculator has been released. I don't know how useful this calculator is. For me, the calculated salary is too low. Others in the comments say that it's too high. In any case, one needs to decide for oneself what salary is right - the calculator can't really help. The calculator only considers the software industry. Update: Seems the currency issue was a big contributor to the below. I'm leaving this here; one just to show what was happening and two because I still think it's flawed to treat entire countries as a single place. So my salary is low according to this, by low I mean at least half (25th percentile) if not a third (75 percentile)! I've been involved in recruitment for multiple companies and I've worked in this industry for 15 years in the North West of the Uk. There is no way on earth I could earn that amount of money where I live. No jobs are advertised within 100 miles of me where I could earn that amount of money (on SO jobs or elsewhere). So I would say something has gone badly wrong in your figures here. They don't seem to add up to anything matching my experiences. I'd say at least one major problem here is you seem to be treating the UK (65 million people!) as one place. It's obviously very diverse. My guess is that your figures are very skewed towards major metropolitan areas and especially London (I've discussed SO Jobs obcession with London before). Now I live in North Wales, But I'm within commuting distance of the cities of Manchester(3rd biggest city in the UK) and Liverpool(7th biggest), not to mention the M6 belt where lots of large tech firms are based. Doing a quick search on SO jobs (and others) to within 100 miles of me I can't really find a job paying much more than what I'm on now. So where are all these incredibly well paying jobs? I'd like to show these to my boss at my next pay review?! I'm guessing that's why the areas are so broad? Did you not have enough of a distribution to produce figures for smaller areas? To help put these figures into perspective it'd be nice to see a distribution of where the respondents reside within a geographical area? My guess is that they would be heavily skewed towards the South East of the UK. 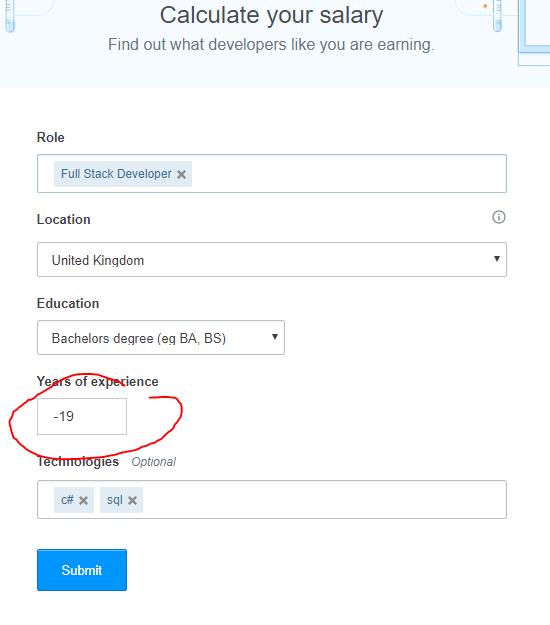 I think what it shows is that this calculator is heavily biased towards tech startupy types of companies, given that it doesn't even have Software Developer/Engineer as job titles..
Minor thing... Why does it even let you select an experience level < 1? Granted it warns you after you hit submit, just seems like something that you shouldn't be allowed to do in the first place. Since the Netherlands is not available, I choose to check the calculator for Germany. As far as I know the salaries are bit higher there, but not by much. But I feel the "Years experience" is more an "Inflation salary increase bonus". I toggled all options a bit and they seem to add about 3% per year, no matter you education level or field. It roughly translates to about 100 euro a month for the first 10 years. Now that may be true if you stick around the same company forever, but you'll advance more if you switch around more often. I think that's the main reason some say the results are higher and other say it's lower. I get a lot of job offers and went to a few interviews, and most often they offer at least a €500 increase per month if you have something to offer. Convincing your own boss to give you a 500euro raise is tough, but convincing somebody that wants you is a lot easier. Especially if you already have a job and can set some demands. I also noticed that companies that need to dispatch you to their customers, are much more concerned about your education. They need you to have papers to be able to sell you to their clients and thus a degree is worth a lot. If you interview with companies that need you for their own software, they are more interested in your actual experience. This also doesn't show other benefits. I have friends that earn less, but do get a company car and basically all the gas they require, even for personal use. In the end they have more to spent than me, because I have to pay for it myself. My advice: If it's your first job, go for something where you can learn a lot and are not some small part of a massive machine where you constantly do the same thing. This might be a smaller company that pays less, but the broader experience is gold. Then if you want the big money, don't be shy to look around after a while (not every month) and sell yourself for more money. But no matter where you are: You'll have to prove yourself, if you want more money. And to be honest, most developers I have met the past 10 years, are simply very basic. They get things to work usually, but don't ask how. And "10 years experience" often means they learned something 10 years ago, and are still doing the same thing over and over again. One of the issues I'm finding while using it is that I can't add a new Job Title and add my own salary in there; For instance Solutions Architect does not exist as a job title (neither does 'Architect'). I haven't tried Archillitect yet. I can say that I would consider even the 75th centile value to be a bit of an undervaluation; the results for US based developers also display quite a big gap at first glance. 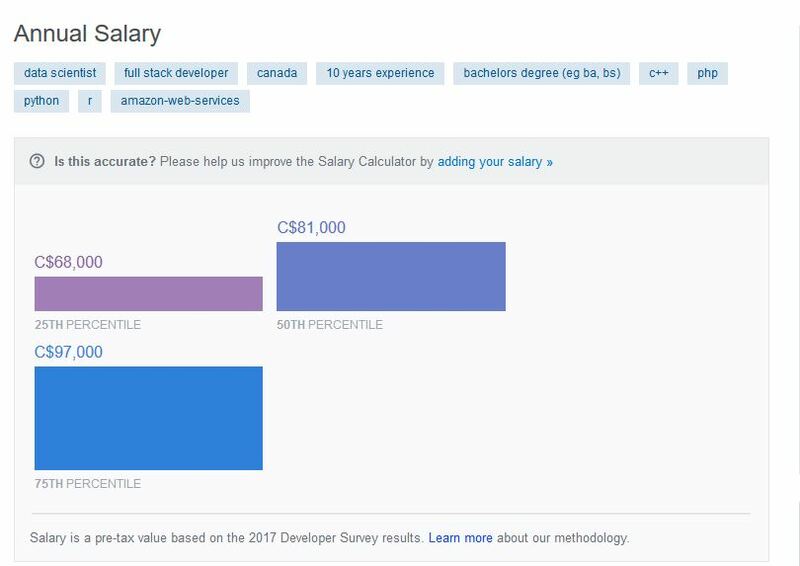 I haven't read this year's salary survey yet, but don't recall feeling like the 2016 version was an underestimate, so maybe there is some bug with the calculator itself? Pointless as all the previous salary calculators outside of the US. As for the numbers... still plain wrong. I'm not even in the 25th percentile (I'm working in France, not in Paris). I'm confused about why SO keeps wasting resources to design such calculators. EDIT: since the fix, the values seem more in line with the real data, though non-London values are I think still a bit on the higher end, but by a much smaller margin. London data however became a bit on the lower end, at least for my searches. The list of tags for languages/frameworks/platforms is too small. I understand that you probably don't have enough data for other tags, and that's okay. However, when I submit my own salary I am confined to using those pre-existing tags. They don't really match me, so you will end up with bad data. So I propose that when adding your salary, the list should be expanded and allow for new technologies. Do you consider work hours? In Germany working for engineering industry results in 35h/week. Other industries have 40h/week. What about salary of part time developers? Just a quick bug report. Seeing that the server side validation of "Years of experience" looks like as: should be greater than zero. But the maximum value you guys check for is: 2147483647 (int32 max value), which I suppose is a tiny bit high... given that someone being more than two billion years old might have some unexpected side effects. The middle figure I was given was 70% above what I was getting. Are these salaries actually paid, as opposed to advertised? How much should I take off the estimate because I'm not in London? How much should I take off the estimate because I'm female? I just have searched for a word "tax" on this page, as well as on the blog page by Julia Silge that led me here. No occurrences found. Although technically the calculator is still correct without the tax mentions, it might be a good idea to compare how much the developer really gets "in cash" so to say, because someone might want to use this calculator as a supplement in consideration for choosing the country for the next job opportunity that offers relocation. What's the point to move to the country where your salary might be up, but the tax will be so high that you get less in the end? How to remove New-Button in bar? Is this Salary Transparency calculator accurate for inexperienced developers? What makes New York and San Francisco special on salary calculator?